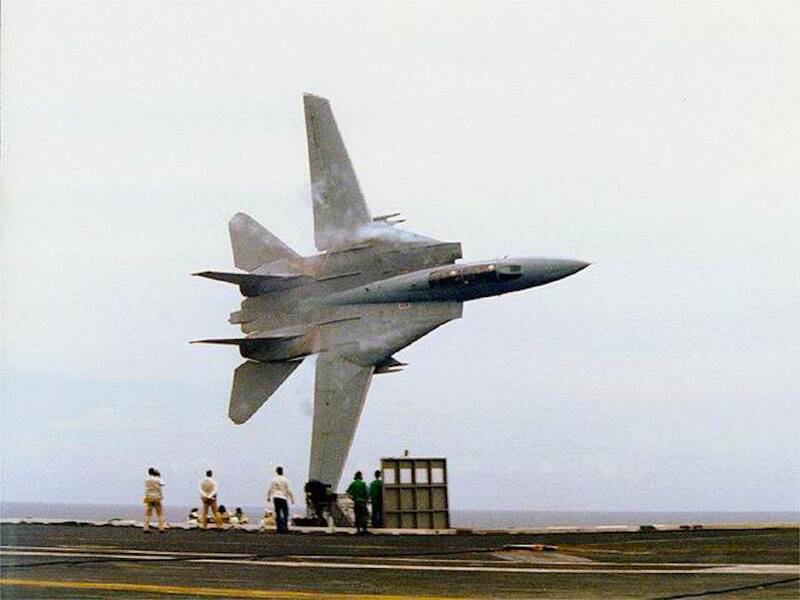 Taken in 1988 from the flight deck of USS America (CV-66) and the photo in this post shows F-14 Tomcat driver Capt Dale “Snort” Snodgrass performing his (in)famous super low banana pass. And, as told by Sierra Hotel Aeronautics, no, Snort was not grounded. Snort is not your typical ex-naval aviator. He is closer to a modern-day Chuck Yeager-like prototypical fighter pilot. According Lou Drendel’s book Tomcat: The Grumman F-14, he is the high-time F-14 Tomcat pilot (with over 4,800 hours in the F-14), a former Commander of Fighter Wing, U.S. Atlantic Fleet, (FITWINGLANT) the home of all Navy F-14 squadrons when they were not at sea. While still commander of FITWINGLANT, he devised and flew a formation aerobatic routine with a World War II-vintage Grumman F7F Tigercat, piloted by John Ellis. Given the widely varied performance envelopes of the two Grumman fighters, it was one of the most impressive displays of aeronautical skills imaginable. One of the least heralded, but perhaps the most important accomplishment of his career, was his oversight of the conversion of the Tomcat from a fleet defense interceptor to a deadly smart bomber. Captain Snodgrass is an internationally recognized Air Show Pilot. Having flown F-14 demos at airshows for 14 years, he has additionally qualified in the F-86 Sabre, P-51 Mustang, F4U Corsair, T-6/SNJ Texan, MiG-17/21, A-4 Skyhawk and F-5 Tiger. Snort currently flies as Lead Solo on the Black Diamond Jet Team supporting the Make-A-Wish Foundation. He also serves as Draken International’s Chief Pilot, Director of Deployed Operations and Congressional Liaison. However that shot off of the America is very widely used and most people seem to initially think it is either an edited photo, or a risky maneuver. Here’s the video of Snort’s legendary super low Banana pass (you can find a Slightly better version of the video here).